Continuing with our Black History month theme, fourth graders heard Lesa Cline-Ransome’s wonderful book, Light in the Darkness. It tells the story of slaves who risked all to learn to read and go to school. The illustrations are wonderful. I chose the one above to project and students did the Visible Thinking Routine called See, Think, Wonder before I read the story. 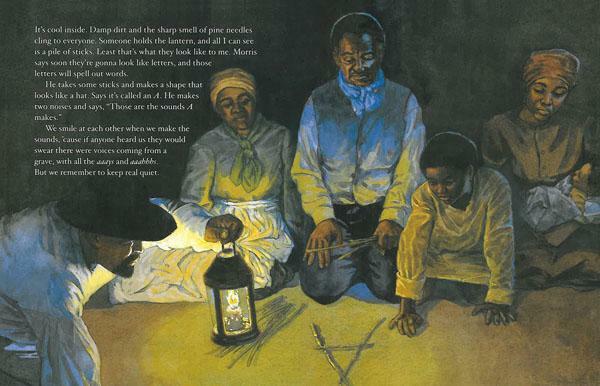 This book and its story made an impression on students as they considered what is was like for a slave to try to go to school as compared to how they go to school. The book is so well written and the suspense kept them on the edge of their seats. This is a perfect read aloud for Black History month for their grade level. 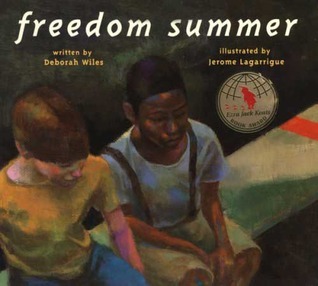 Fifth graders heard Freedom Summer, a wonderful book by Deborah Wiles. I first projected an actual photograph of men in the 1960s filling in a pool with asphalt and students did the Thinking Routine See Think Wonder. The story has a simple plot, elegant in its simplicity, so that the deeper meaning of the story shines through. We had a lively discussion at the end about segregation and what could have motivated the people in the town to fill their pool with asphalt. It is encouraging to me to see that our students today find that kind of behavior incomprehensible. Kindergarten and Sixth had no library this week due to President’s Day.